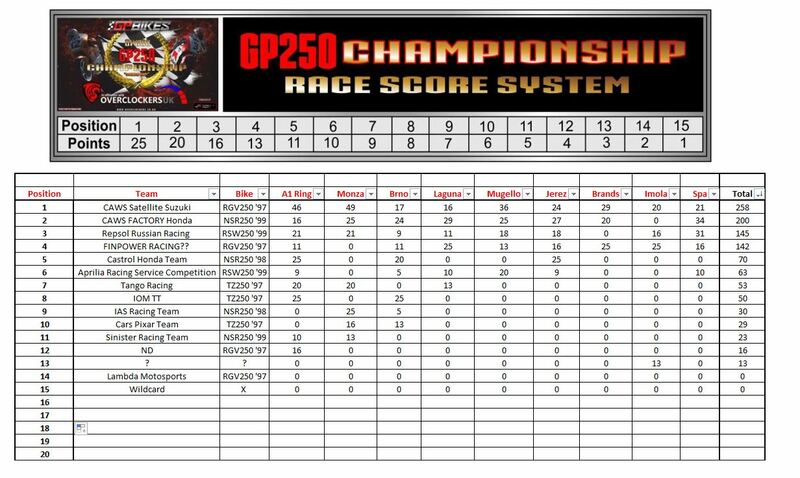 Wildcard riders points removed and people moved up. Oh yes i forgot to mention about the team championship! CAWS SATELLITE SUZUKI TEAM in first position , yeah! Yeah! well done CAWS satellite Suzuki! Well done on finishing first and well ahead of the rest of us! CAWS 1 and 2. WOOP! Anyways thanks for a great championship everyone! Enjoyed the whole season very much even i had a few races where i just couldn't make it work and keep the wheels on the ground lol. Was a real pleasure to see how many different tactics there is and that sometimes the fastest rider is not always the best over a full race distance (includes myself mr. crash-a-lot in a few races). BIG THANKS TO DD for organizing, providing servers, live streaming and being there for us at every race! TOP JOB! Thanks for all the congratulations and thanks for the fight right until the end Guys! especially Finpower and Warlock! was a close one. Congrats on the podium Fin and Warlock! Well done Meyer! Congrats mate Great ride as always. Brilliant finish Fin! Your relentless fast and careful riding pays off with a well deserved position. And well done Warlock, a true hero riding 1st Person better than most of us can 'cheat' in 3rd person lol! Great ride mate. And thanks to everyone who comes to the championships and tries and learns and especially to our very own Livestream commentating and server hero - DoubleDragon for setting it all up. Cheers mate. Oh and Congrats to the Satellite CAWS team champions showing the factory team who is really the boss. Lets get another going ASAP! 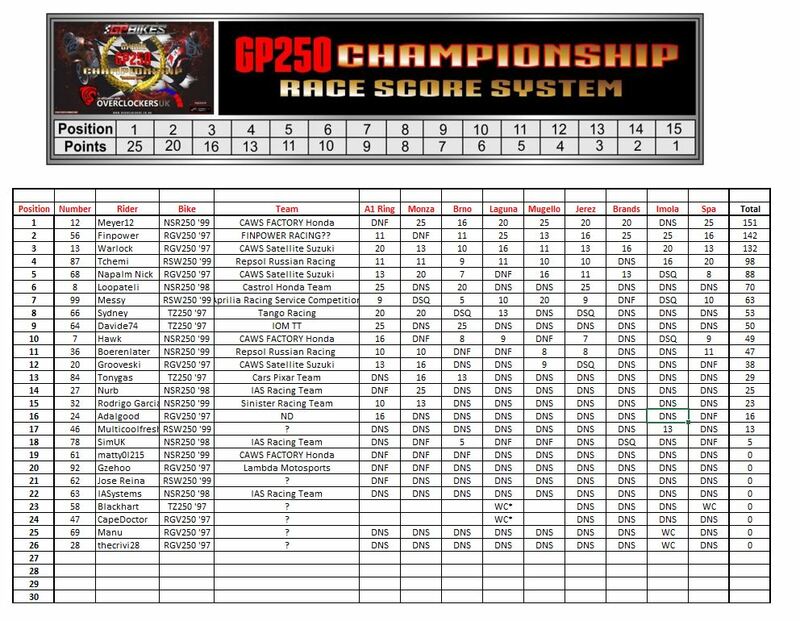 Edit: Championship standings copied up to the first post thx Meyer. Haha yeah! Very well done satellite team!!! Maybe for next one we switch so you can get the factory rides?